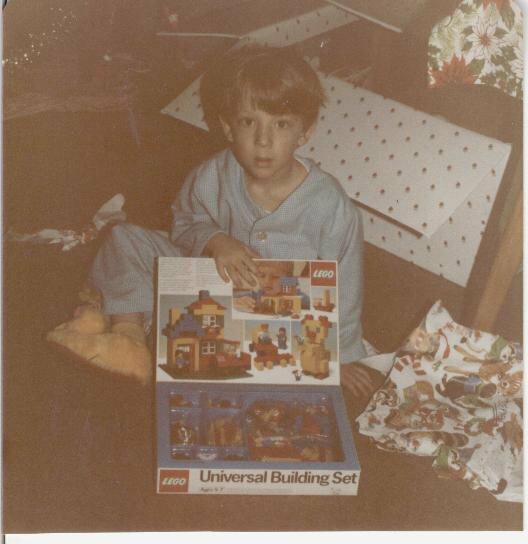 Before we had our own sets we were building with family Lego sets from the 1960s. My first castle sets were 6010 Supply Wagon and 6030 Catapult. Later I received 6080 King's Castle, a personal favorite of mine. It's funny how lots of people had just a generic box of Legos that they inherited before getting the first set that actually made an impression. Nice. Do you recall which set specifically? I remember making Tie Fighters before there actually were any Lego Star Wars sets. I'd use a couple of big green base plates for the solar panels with a block of 2x4's for the cockpit. I don't think anybody would have recognized what it was supposed to be but myself. It would be nice to find a picture with the inside lid of the box. Looking closely… the top-left corner of the second picture in that page looks like it has a partial image of the same model in the very center of the lid in your photograph. Looking in Bricklink, one of the sellers had a photo of the inside lid. It definitely looks like the same set. Yes that is it. I remember the instruction manual.